Anjezë Gonxhe Bojaxhiu was born on 26 August 1910 in Skopje – then in the Ottoman Empire, now FYR Macedonia – into a Kosovar Albanian family, and became a religious sister and missionary of the Roman Catholic church who was known universally as Blessed Teresa of Calcutta. She passed away on 5 September 1997, in Calcutta/Kolkata, West Bengal India. It may be sacrilege to ask – ‘So how rich was Mother Teresa?’ – there are no concrete figures at all to suggest that she had any private funds, or bequeathed any amount on her passing, although it is indisputable that she eventually attracted millions of dollars in donations from numerous benefactors from around the world in support of her work, not only in India but eventually spreading to many other countries too. Questions have been posed because of rather lax accounting practices in Teresa’s organisation, including failure to advise their financial position in India, as required by laws governing charitable organisations. The answer seems to be that all is spent on administering to an apparently ever expanding number of people in dire need of assistance, around the world. Mother Teresa Net Worth $?*****$? ‘Agnes” father Nikolie was involved in local politics, but died when she was nine years old. She was apparently fascinated by tales of missionary work from a very young age, and became convinced by her late teens that she should contribute in some way, allegedly confirmed to her during a visit to the shrine of the Black Madonna in the Kosovan town of Vitina-Letnice when she was 18. She almost immediately left home – never to return – and joined a Loreto Abbey at Rathfarnham in Ireland, to learn English as well as the basics of teaching and missionary work. Agnes travelled to India the following year, learnt Bengali and taught at St Theresa’s school in Darjeeling, and adopted the name of Teresa – patron saint of missionaries – in 1931 when beginning her religious vows. She subsequently moved to teach at the Loreto school in eastern Calcutta, took her final vows in 1937, became headmistress in 1944, all the time observing the poverty around her, and also the Hindu/Muslim violence after the end of the Second World War. Whilst appreciating that her teaching was valuable, Sister Teresa became more concerned with the general condition of millions of people that she saw all around her – the ‘black hole of Calcutta’ was particularly notorious – and so determined to try and alleviate their suffering. She was later to describe the moment when she felt called to another vocation away from teaching, during her annual retreat to Darjeeling in 1946, and she subsequently started a school in Calcutta in 1948 which very soon became a haven for ‘the poorest among the poor’, although she continually struggled through lack of support, including for basic food stuffs. However, she attracted a small group of female activists who certainly leant physical support, and also began attracting donations of all types. 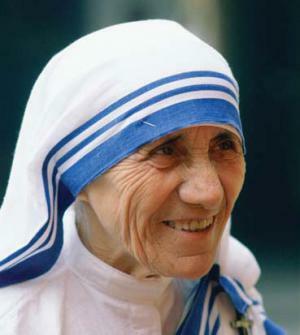 Teresa was then supported by the Vatican in establishing what would later formally become the Missionaries of Charity in 1950, also with some support from the Indian government. She converted a donated derelict Hindu temple into a place for the dying, regardless of their faith, and established several clinics around Calcutta to care for sufferers of leprosy. The third arm of her concern, for orphans and homeless children, was begun in 1955 – the Children’s Home of the Immaculate Heart was opened. It was during this period that Teresa became known as ‘Mother’, for obvious reasons. Such was the spread of Mother Teresa’s work that many more philanthropists took notice, and donations increased so that more and more people in need could be cared for; additionally more supporters became directly involved. From the early 1960s, hospices were being opened in other parts of India. Somewhat surprisingly, the first facility in another country opened in Venezuela in 1965 with five sisters, and further were soon opened in Rome, Austria and Tanzania before 1970, and in the following decade in many countries in Africa, Asia, Europe and even in the United States. Concurrently, other organisations devoted to these charitable works were founded – The Missionaries of Charity Brothers in 1963, and the Sisters eventually in 1976. Lay men and women – Catholic and non-Catholic – were incorporated into the Co-Workers of Mother Teresa, the Sick and Suffering Co-Workers, and the Lay Missionaries of Charity. The Corpus Christi Movement for Priests was founded by Mother Teresa in 1981, and then in 1984 the Missionaries of Charity Fathers which combined charity with the priesthood. In total, the Missionaries of Charity had grown to over 450 brothers and 5,000 sisters worldwide, operating 600 facilities in 120 countries by the early 2000s. Secondly, in 1996 she received honorary citizenship of the United States of America, an award very rarely bestowed, for her support of work among the poor in the USA. However, most importantly perhaps, Mother Teresa was beatified as “Blessed Teresa of Calcutta” by the Catholic Church in 2003. The next step would appear to be inclusion in the sainthood of the Catholic church. Despite some criticism of her institutions regarding unsanitary conditions, and her stance on such issues as abortion – definitely anti- – at the time of her passing, Mother Teresa’s influence had spread to the extent where 610 missions in 123 countries had been established, incorporating 4,000 sisters, and an associated brotherhood of 300 members; co-workers numbered more than a million. Included in this on-going worldwide battle are refuges for people with HIV/AIDS, leprosy and tuberculosis, among other diseases, personal helpers orphanages, and schools. There is little doubt that Mother Teresa was one of the outstanding figures, indeed leaders of the 20th century. 1 If a Mother can kill a child growing in her womb, then what is to stop us killing each other? 2 Loneliness and the feeling of being unwanted is the most terrible poverty. 3 The fruit of love is service. The fruit of service is peace. And peace begins with a smile. 4 It is a poverty to decide that a child must die so that you live as you wish. 2 Pictured on a 44¢ USA commemorative postage stamp issued 5 September 2010 in Washington, DC. 3 Joined the Sisters of Loreto as a missionary at the age of 18, which meant that she would never see her family again. 4 Was chosen "most admired person of the 20th century" by a poll in the United States (1999). 5 The airport of Albania's capital Tirana was named "Tirana International Airport Nënë Tereza" in 2002. 6 She was awarded an Honorary A.C. (Companion of the Order of Australia) on January 26, 1982 for her services to Australia and humanity worldwide. 7 Diagnosed with heart problems in 1974, a fact which she tried to keep secret. 8 While being a nun, she taught geography and basic literacy. 9 Fluent in English, Albanian, Serbo-Croat, Bengali, and Hindi. 10 Born to Nikola Bojaxhiju and his wife Drane, she was the youngest of the family's children. 11 Often addressed by her middle name, Gonxha, which means 'flower bud' in Albanian. 12 Beatified by Pope John Paul II in 2003. 13 Was of Albanian origin. 14 Died nine days after her 87th birthday and just five days after the death of Princess Diana, who supported charity and once met her in India. 15 First and only person to be featured on an Indian postage stamp while still alive. 16 Founded the Missionaries of Charity in Kolkata, India (October 1950), which had over 610 missions in 123 countries at the time of her death. 17 Was made an honorary citizen of the USA by President Bill Clinton. 18 Marvel Comics published a comic book about her life entitled "Mother Teresa of Calcutta" (1985). 19 Was awarded the Nobel Peace Prize "for work undertaken in the struggle to overcome poverty and distress, which also constitute a stress to peace" (1979).